Leinster get their Champions Cup defence underway today in a titanic clash against Wasps. Both sides have named strong teams for the encounter with James Lowe being the only Leinster player in the starting line up without test experience. Brad Shields' start to his Wasps career has been marred due to injury in his debut for the club but has made a timely return for the English side. Dan Leavy has made two appearances for Leinster so far making 11 carries and 20 tackles in just over 80 minutes. Both players have a point to prove ahead of the November tests and are both likely to make a massive impact on the match. They both have an impeccable work rate and a wide range of skills from their work at the breakdown to their attacking threat around the park. Arguably the biggest head to head of the weekend. Both players are amongst the flyhalves in the game and their performances in this match could decide the result. Sopoaga has already made his presence felt in the Gallagher Premiership and will want to continue his fine form on his European debut. Wasps will be aiming to keep Sexton quiet in this clash with the Irish International able to turn a game on its head and can almost single-handedly win a match for his side. 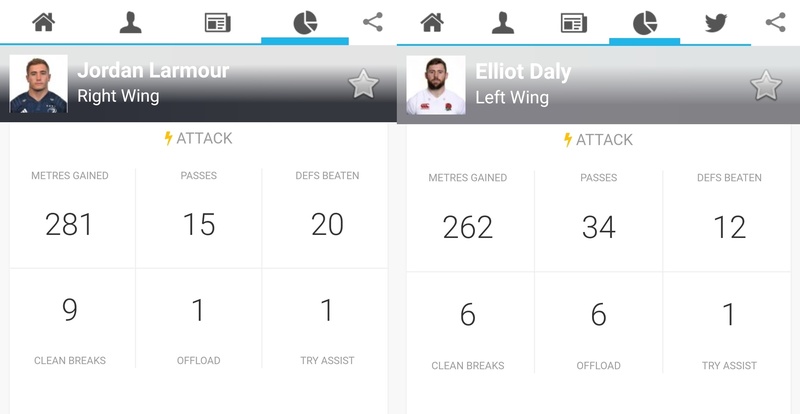 Yet another mouth-watering head to head, this time it's out wide with the young Jordan Larmour lining up against Elliot Daly. Larmour enjoyed a breakout season last year but he has a real battle on his hands today against one of the best wingers in the game. Daly has been shifted around the Wasps backline this season but features on the wing in this match. Both teams will be looking to get their respective wingers into space and they will almost certainly make the most of their opportunities. Larmour has made 4 appearances for Leinster so far this season while Daly has featured in all six of Wasps' matches so far this season. Finally, the battle of the two fullbacks. Le Roux returns to the Wasps' starting XV having starred for the Springboks in the Rugby Championship where he ended the competition with 5 try assists - joint highest total in the competition. Kearney has also been in fine form for Leinster to start the season and will look to continue in that vein. The two fullbacks have contrasting approaches to the game with Le Roux being one of the deadliest attackers while Kearney is one of the most complete fullbacks in the game.